My next several posts are going to be all from the same meal (I have already posted the salad dressing and the dessert!). This was one of our “fancier” meals growing up and when Mama made it, our busy teenage worlds stopped so we could all sit down at the table. When I was younger, one of the best restaurants in Huntsville, Alabama was The Fogcutter. I remember one evening I had plans to go there on a date when I found out Mama was making her Eye Of Round meal for supper that night. I actually called my date, had him cancel the reservations, and invited him to eat at our house instead! 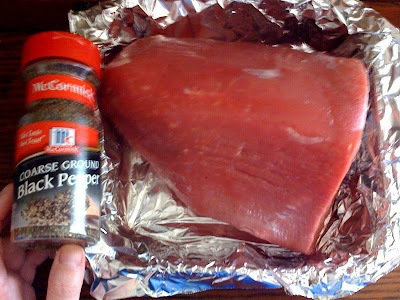 This ingredient list is easy to memorize: eye of round roast, and coarse ground black pepper. 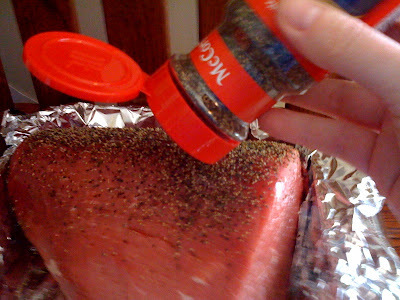 Generously sprinkle pepper on your roast. Until it looks like this. There, you’ve prepared your roast! Now, stick this in an oven preheated to 500 degrees. Wanna see my new favorite thing? My mother always used an electric knife to slice her eye of round. I’ve never owned an electric knife and I had always assumed, whenever I thought about getting one, that they would be expensive. Enter my new favorite company, Hamilton Beach. I got this electric knife with a really nice carrying case, for less than twenty dollars!!! IT IS SO AWESOME! Eye of round is a tender roast, but difficult to cut. In the past, I have always used one of my knives and done it by hand. Doing this, though, yields thick slices that look somewhat “hacked”. I was never able to get the gorgeous thin slices like my mother did. WELL, CHECK THIS BABY OUT!! It took me a second or two to do each slice, that’s all! I can’t wait to make a ham now that I have this! I love that it has a storage case so it doesn’t get lost in my utensil drawer. Did I mention that the blades are dishwasher safe? Nope, Hamilton Beach did not pay me or in any way sponsor this post! 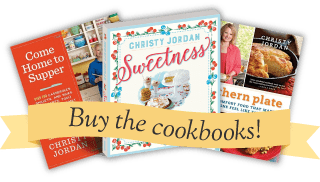 They are also the ones who make my awesome 3 in 1 slow cooker and I have another AWESOME Hamilton Beach innovative product that I am going to be writing about soon. They are just nice people who make great products that us normal folks can actually afford. Okay, so basically, I love my electric knife! And you’ll love this Eye Of Round!! Generously pepper roast. 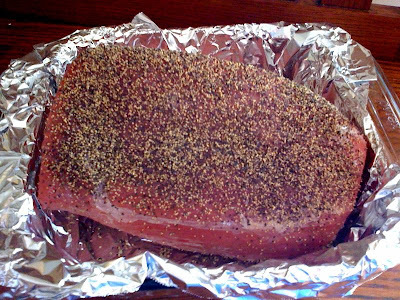 Place in pan lined with aluminum foil or sprayed with cooking spray. Place roast in preheated 500 degree oven. bake 5 minutes per pound plus 10 minutes. Turn off oven - DO NOT OPEN OVEN for two hours. If it is a long eye of round, cut in half and place side by side in pan leaving a little space between the halves. This is my week in DISNEY WORLD!! I have written up a series of great posts to go up while I am away. They are all part of this one special meal my mom used to make us so be sure you stay tuned to watch the meal unfold! I will be checking in from time to time and responding to comments a little while I am away so don’t go quiet on me! I do hope you all have a wonderful week! I’ll tell Mickey “hi” for you! You can follow my Disney reports and photos on my Twitter which is at the bottom left of this webpage. Oh wow, this looks mouth watering! I bet it would make great sandwiches the day after! I’m looking for a good cheese grits recipe, any ideas? We have an electric knife as well. It cuts bread well too. Such a great invention – everyone should have one in their kitchen! That roast looks so amazingly delicious. I love beef, though we don’t eat it often, that is just making me drool like crazy. Yum! I’m going to google eye of round and see what cut of meat that equates to here. 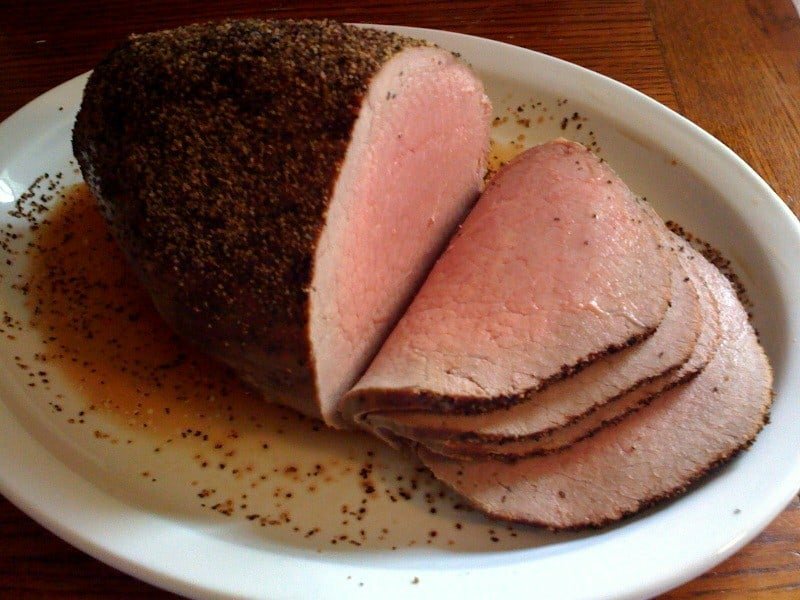 Your photos make me want to try roasts again…it looks so tender and pink. Mmmmmmmm. And yep, I’m with Joan on the sandwich idea! This is amazing, because the day before I left I did a tutorial for grits! I just have to write it up and post it when I get home. I LOVE grits and there is this great little mill that still grinds theirs with the big old stone that I get my grits from. They are SO GOOD! Now I am wanting grits today! My chances of finding those in Disney are about as good as my chances of finding a Diet Dr Pepper. You know you can’t get Diet Dr Pepper on Disney Property? You can only get Coke products. Coke is a big sponsor of Disney and actually DONATES every single carbonated coke beverage sold within the parks! Su! Oooh, I hope you do get to try this. I still want to make those lamingtons you sent me the recipe for. I am going to attempt them when I get back after I get some tutorials done that have bee requested. Hope your mother is doing well and y’all are having great weather in Australia!!! Thanks Christy….the weather here seems to have reverted back to winter for the day, it’s all wet and gloomy. Hope you’re having a great time in Disney World. If you do get around to making the lamingtons make sure to post it up! I’d love to see how they turn out. Hi Christy I’m new to your website and I have really enjoyed looking at all the recipes and pictures of each step! I’m going to try the eye of round tonight. It looks good and I have seen some recipes for other cuts of meat where they cook it on a high temp and then finish by turning off the oven. I’ve never tried this but will let you know how it turns out! Hopefully it will not be tough or dry as I think I’ve tried this cut several years ago. And, it doesn’t have much fat which is good, but can be easily dried out and not flavorful. ok I tried it and it was good. I did add some garlic powder and used Kosher salt. When I took it out at the proper time, I found it to be more on the lukewarm temp so I popped it back in the oven for about 12 more minutes at 350. I do think having an electric knife is the key as you really need to have thin slices. Had au jus with it and that was a nice addition. Have you ever cooked eye of round roast with gravy? If not try this. Place the roast in a pan, mix 1 large can of mushroom soup with 1 envelope of onion soup mix, pour over roast, cover tightly with foil and bake. I usually cook at 400 degrees for an hour or so to get things boiling then turn to 350 and cook till done. You will love it, best gravy in the world, I promise. Kinda hard to take this recipe seriously when you forget an ingredient so basic basic, yet absolutely critical. Salt. I sincerely hope I never take myself seriously! Oh my goodness! Made this for dinner tonight and it was delicious! Followed the recipe directly as written and even pulled out my electric knife for this one. Husband and picky daughter gave it two thumbs up. Thanks! WOW what a great recipe, and so simple. I’ve been cooking roasts for years (especially EOR) and it’s always been unpredictable – overcooked, dry etc. this roast came out absolutely perfectly and OMG what flavor. I added not only the heavy pepper, but light salt and garlic. I found my “go to” recipe from now on. Thank you! This is the only way to cook eye of round because it is such a lean piece of meat. Makes for great gravy. Last Christmas Eve, I cooked two 5lb standing rib roasts the same way. Perfect! I tried the method out the week before using a 5lb roast for the two of us. So glad you like it Vicky!! Perhaps you should spend a little less time being rude and a little more reading the recipe card at the bottom of the post where it clearly states how long to cook it for.